As the European Environment Agency (EEA) reports, the residential household sector is one of the largest users of energy in the EU, consuming roughly 30% of final energy consumption (excluding energy for transport). Nevertheless, Social housing represents 25 millions of dwellings and at least 50 million of inhabitants in Europe. Tenants (and landlords) in social housing at the moment receive mostly only historic data on their energy and water consumptions. This is very often in the form paper based (a bill) data which is sometimes unintelligible to the tenant and landlords and does little to actually inform them about the impact of their actions on the real savings which can be achieved. Information about water consumption is passing through the same situation as the described energy information. In this abstract is presented the activities developed under the project ENERGYTIC, which is targeting to solve the above mentioned situation and provide the ICT means to allow final users how to optimize the energy consumptions in social housing. ENERGYTIC (www.energy-tic.eu) is founded by the European Commission through ICT PSP Work Program 2010. Social housing incorporates the segment of the population having the lowest incomes in average, so this is the most challenging group of users which can be addressed by a project. A more frequent update of water and energy consumptions in order to be able to actively monitor it and adapt their behavior to reduce those consumptions, at both individual and neighborhood levels. Real examples about how to achieve their savings, at individual and neighbourhood levels. Consumption benchmarked information in its own usage category of dwelling. Links to websites where objective energy efficiency improvement measures and/or objective technical specifications for energy-using equipment are presented. As of today, many users cannot understand how they are charged and are not conscious of their way of using energy and water; bills incorporate too technical information and bar graphics showing total monthly consumption, either real consumption or estimate consumption. There is no way to compare user’s consumption under the same category of social housing use. There is no way today for users to understand the different alternatives they have to save energy and water at individual and collective usage. Finally there is no way to have a summary of links to websites where energy and water saving programs are proposed at regional and national levels and understandable for “common” users. All these items will be considered under the scope of the project thanks to the ICT tools to be deployed in the pilots. EnergyTIC project put into place two pilots in two different countries, with different innovative ICT solutions, that will engage end-users with relevant information and messages to achieve the target savings in water and energy, at individual and neighborhood levels. One of the two pilots will be located in Spain in Málaga, where 700 dwellings are involved in this pilot in order to demonstrate savings in energy and water thanks to the use of innovative ICT solutions in Social Housing. EnergyTIC project include two types of group of users inside each pilot. First group of users is called the treatment group, i.e. those users who receive information through the ICT based solution. Second group is called the control group, i.e. those residents that do not receive the information through ICT based solution but receive only the supporting materials and general information about good practices on energy and water savings. EnergyTIC project works are divided in work packages (WPs). One of those WPs in the project is named “WP3 Spanish cluster”. This WP3 is taking into account the Spanish pilot definition and implementation. Selection of the representative sample of users in social housing, identification of what would be their requirements and definition of service to be provided. • Information chain implementation: data capture from energy and water data bases, data adaptation & statistics calculations, information transport up to the user Digital TV. • Maintain the operation of systems and services throughout the pilot and set up and provide help services to pilot users. • Design and verification of neighborhood ICT solutions adapted to the reality of social housing in Spain. • Achieve the savings on water and energy (minimum 15% on energy) savings with a service easy to deploy and escalate in the market following the EnergyTIC project targets. • Future rapidly deploy of service in the market. Creation of group of users. Information chain implementation: data capture from energy and water data bases, data adaptation & statistics calculations, information transport up to the user Digital TV and information presentation trough a WEB site. Technical district solutions which will be analyzed through the project, taking into account the social and economic situation of the site selected for the pilot. Inside the Spanish pilot, EPSA (Empresa Pública de Suelo de Andalucía) is responsible of selecting the locations and users to be considered under de pilot. 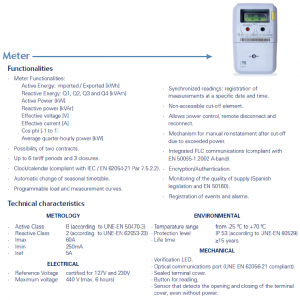 After a deep analysis of different neighborhoods in Malaga, and their capability to install individual smart meters inside the buildings (specially water smart meters), EPSA has concluded that different neighborhoods have to be taken into account. A first neighborhood to be studied is the one called “Las Flores”. 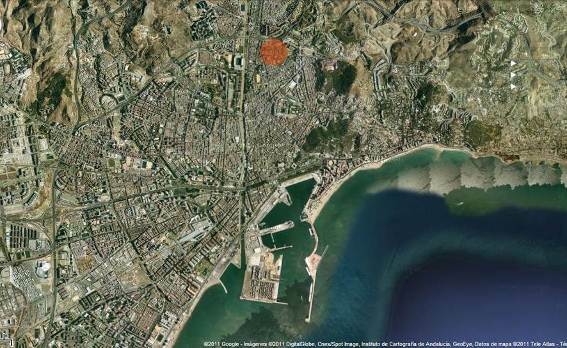 It is located in the northern city of Malaga, on the left bank of the river Gualdalmedina, with its boundaries formed as described below. To the north, “Manuel Gorria” Avenue, South to “Albéniz” Street and its extension; separating the old neighborhood of “Cementerio de San Miguel” ; Old Cemetery, that has been transformed into an urban Park, the east, by the Industrial Complex “Centro-Olletas”; to the West, “San Juan Bosco” Street. Figure 1: General Malaga view. Neighborhood marked. 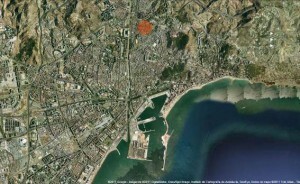 A Google maps aerial view courtesy. It lies on the side of a hill facing south, the topography of the changed slope gives way to a series of terraces on which they are based various housing groups, connected in general though pedestrian streets equipped with stairs and ramps. It has a single road inside the neighborhood. Access to the neighborhood can be done by the south from Albéniz and Arroyo del Cementerio Street. The exit can be done by the previous street or though the first section of “Obispo Bartolomé Espejo” Street or towards “San Juan Bosco” Street. The rest of the roads are pedestrian. Figure 2: General neighborhood area view. Neighborhood marked. A Google maps aerial view courtesy. Houses to be included in the pilot need to have individual meters for energy and water. In EnergyTIC consortium, Endesa is responsible for the electricity consumption data gathering and sending to CITIC for their treatment and dissemination. 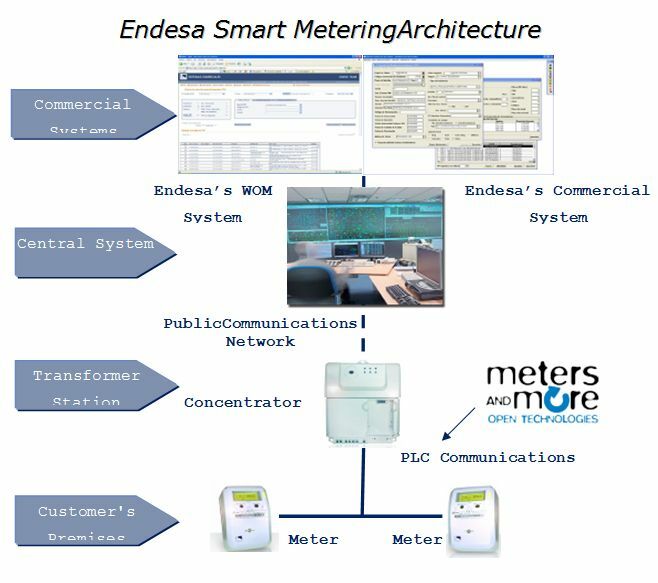 Endesa is a leading Electricity Distribution Company in Spain and is deploying a smart metering system. This system will allow Endesa to gather electricity data with a high periodicity and accuracy. This solution is going to be used in the selected dwellings in the Spanish pilot. Communication between central system and meters is achieved through a communications concentrator. Concentrators communicate with meters using PLC (Power Line Carrier) technology, i.e. using the electricity distribution lines for signal transmission. Concentrators are installed in the transformer stations and each one communicates typically with 200 or 300 meters. Central system communicates with concentrators using GPRS technology and public telecommunication networks. All transmissions include encryption and authentication for security and data protection. The protocol used in the system is Meters and More protocol, which is open and in process of standardization in Europe. In EnergyTIC Spanish pilot, EMASA, is responsible for the water consumption data gathering and sending to CITIC for their treatment and dissemination. EMASA smart meters used by this project are electronic meters from Contazara. Series CZ2000 and CZ3000. 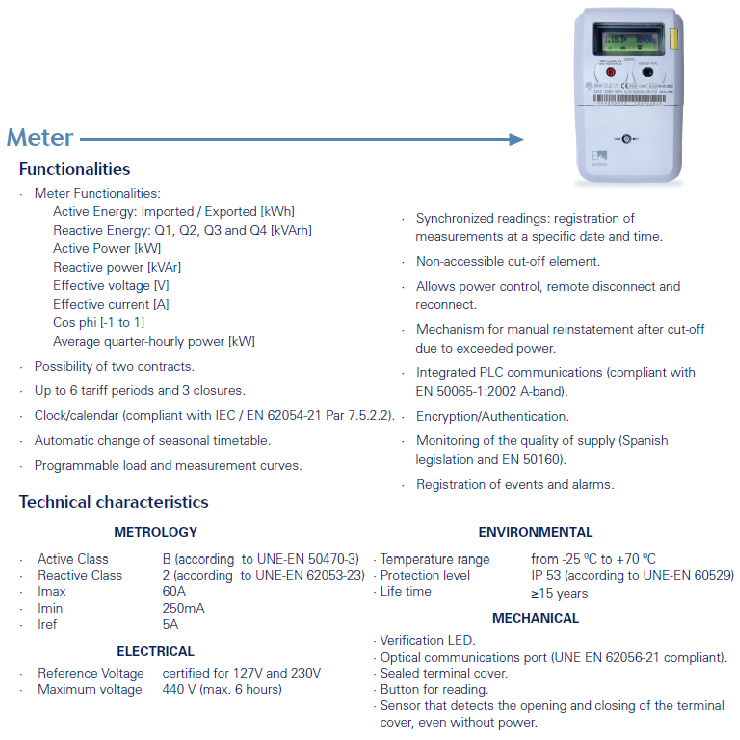 Really, CZ3000 is the only one to be used, because CZ2000 is an old model, in phase out status, and it is known none smart meter is installed in dwellings selected for pilot and, for that, EMASA will mount for testing the current version CZ3000. Accurate measurement during the time of service required. Reliable operation for the duration of service required. None external power for operation. Storing a large amount of statistical data in consumption. Easy access to stored data on the consumption registered. Read index. This data is the cumulative amount of water that has been register by the water meter. Time to leaks, leak alarm. This type of counter is able to discriminate whether the flow of water is made ​​of an abnormal shape. Histogram of consumption. This information is provided by the counter used to know which water flows each customer consumes. Sections consumption schedules. This information is provided by the meter used to know at what time of day the water consumed each customer. Provide these data to each customer can be especially helpful for each client knows how to consume your water and what control mechanisms could be applied to reduce consumption. 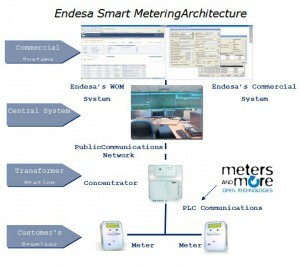 With the management of these basic data for the meters, it is possible to characterize the water consumption by each customer and, therefore, is likely to provide information to each customer in this project: as an example of how to display these data to clients, it is presented below a graph of the prototype application done by EMASA. o allows remote access on-line individually to any counter in the system to download data stored in it. o allows to program the massive discharge of the meter data so that in an unattended way, the data of all counters are stored in DD.BB. of EMASA. Protocol GPRS/UMTS. Using these technologies for mobile communications, the central nodes RIAC system communicates with central server system to send its data to the Data Center of EMASA. The EMASA Central Server where is hosted all communications services plus storage of all counter data will be a HP Proliant DL380 G7 LFF. This server will reside physically in the Central Data Centre of EMASA and will become part of the cluster of servers of EMASA Information Systems and integrated into the established security policies of EMASA. This server will mount the Windows Server 2008 Operating System. The communications and control applications will be developed in the environment of Microsoft Visual Studio. The D.D.B.B. where will reside all counter data will be implemented over SQL-Server 2008. EMASA will use in this project the interface system developed to communicate RIAC with other systems of EMASA. This interface is a web service through which CITIC will manage to periodically ask the server of EMASA all meter data of the project having been received in the system since the last request made by CITIC. 3.4ELECTRICAL AND WATER DATA MANAGEMENT. The participation of CITIC is focused in the data treatment in order to deliver the information in a proper format through MHP DTT and the web. Consumption Information Retrieval: This interface is used to get data from Energy and water suppliers. Web Interface for Landlords or tenants: Through this interfaces landlords or tenants will be able to access the information through a web interface. Interface to the TV Broadcaster: This interface is used to send the consumption information through the DTT. Interface to end users through Digital TV: It defines what users need to access to the information using the Digital TV. 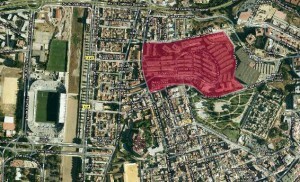 WINDINERTIA designs the district (block solutions) for the Spanish pilot. First concrete proposals will be obtained through 2012, once the pre-audits (based in the information documented by EPSA) and complete energy audits are done. 3.6 VIABILITY ANALYSIS OF DISTRICT OR BLOCKS SOLUTIONS. The viability study of the proposals made by WINDINERTIA is been carried out by DETEA. The first analysis is based on the buildings proposed by EPSA in “Las Flores “neighborhood to study the technical feasibility of installing cogeneration and photovoltaic equipment. Cooling and heating systems will not be studied since with the incomes of the tenants does not allow installing a cooling or heating service. Some section of main water pipe should rise from the ground floor to the roof for its treatment by cogeneration system. Treated water (hot water) will be redistributed from the roof to each household through the kitchen. Hot water pipes need to be insulated to avoid heat losses that take place at the water distribution. Increase the gas pipes section to supply the required consumption would be needed. It would be necessary to fit out the deck to comply with fire-fighting regalement R-240 and the DB-SI. A connection to inject additional electricity to the national grid would be required. On the roof, before cogeneration, we should install a general water meter and an individualized one per household after treated water. Thus, total water consumed is the sum of cold water and the hot one. In case the equipment is installed in the basement, an exhaust gas exit must be added to the installation. hot water to tenants, or any close business in the area requiring such hot water (It seems unlikely to sell this hot water, but this possibility has to be studied in the months to come in the rest of neighborhoods to be included in the project along 2012). Electricity fed-in the electrical network. Fed-in tariff has to be made public by the government. Ensure the roof area or other installation site is capable of handling the desired system size and weight. If roof mounted, verify that the roof is capable of handling additional weight of PV system. Augment roof structure as necessary. This is an exercise to be done in buildings 2, 3, 4. Properly seal any roof penetrations with roofing industry approved sealing methods. Properly ground the system parts to reduce the threat of shock hazards and induced surges. Capability of buildings to support the equipment weight. Return of investment calculation once the fed-in tariff is made public by the government. First pre-auditory studies and the first economical estimations for block solutions. Energy and water savings will be more and more needed in each country, at private and public levels. Energy and water distribution networks use has to be optimized, and the consumption has to be flattened in the peak hours. Introduction of electrical cars will make even more necessary to achieve energy savings and demand curve flattened before 2020. Otherwise supply and demand will not reach a balance with all the associated risks. Por la presente, y como autor del trabajo mencionado arriba, cedo al Palacio de Ferias y Congresos de Málaga una licencia no-exclusiva irrevocable para imprimir, reproducir, distribuir, transmitir o comunicar de cualquier manera dicho trabajo, incluyendo el derecho de hacer modificaciones de formato, aunque no de contenido ni de los logos debido a los compromisos contraídos por el consorcio en las actividades de difusión. Además, afirmo que esta cesión no lesiona los derechos de terceros.